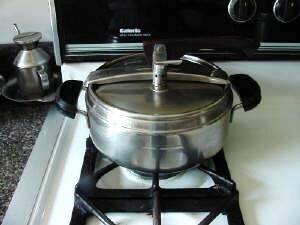 Place the beans and the soaking water into a pressure cooker. Boil the beans uncovered for 15 minutes. Use a big spoon to skim all the hulls that separate from the beans and are floating. Cover with lid and bring the cooker to pressure. Cook for ½ hour on a low flame. Remove from heat, reduce pressure, open the lid and add kombu, celery, carrot, and mushroom. Cover again and bring back to pressure. Cook for 15 more minutes. Reduce pressure, open lid and add Tamari soy sauce. On the side, dilute kuzu with a tablespoon cold water, liquefy by stirring it with a spoon and add to the beans while stirring constantly with a wooden spoon until the beans look creamy. 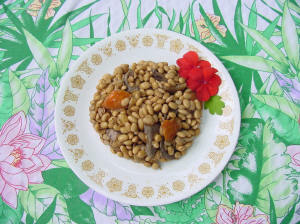 The soy beans cooked this way are very tender and sweet tasting.